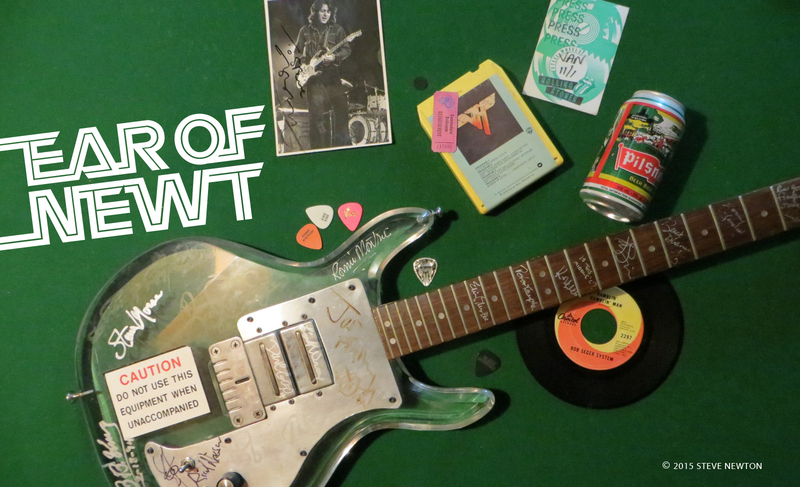 It’s a hard road, and often a long one, that leads to success in the world of heavy metal. With the exception of a few bands that luck out on their debut recordings because radio is good to them, most hard rockers fight an uphill battle to establish themselves and then very often fade into semi-obscurity or cult status because they can’t get any exposure. Scorpions used to be one of those “cult” bands. During the 1970s they released six promising but inconsistent albums that showed a lot of potential but didn’t allow it to be fully developed. Lonesome Crow (1972) was mainly a showcase for then 16-year-old Michael Schenker‘s budding, inspired rock meanderings, and the albums that followed–Fly to the Rainbow (’74), In Trance (’75), Virgin Killer (’76), and Taken By Force (’77)–were highlighted by raunchy tunes like “Speedy’s Coming”. A live LP from 1978, Tokyo Tapes, captured some of the excitement that is Scorpions on stage, yet it sounded like there was something missing. Considering the band’s current popularity and improved, more polished releases, it’s quite possible that something was lead guitarist Matthias Jabs. Jabs joined the band just before their last album of the seventies, Lovedrive, was released. And though that record featured a guest appearance on three songs by ex-member M. Schenker, it was also evident from the interplay between his brother Rudolf on rhythm guitar and the newly-arrived axeman that things were looking up for the German group. 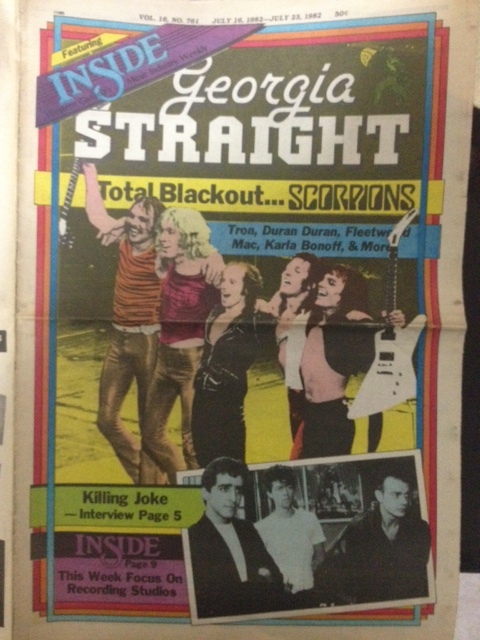 Animal Magnetism and the latest release, Blackout, furthered Scorpions’ name to the point where they now have a hit single in “No One Like You”. But whatever the reason for it, whether it be the addition of a new guitarist or just the eventual reward for years of struggle and dues-paying, Scorpions are beginning to sting. Their new album sold over 140,000 copies in its first week of release in the States, and the band is now promoting it on a gruelling world tour with Iron Maiden and female headbangers Girlschool. What is the heavy metal scene like over in Germany? Well, it’s cooled down a bit because we have a new thing in Germany called the New German Wave. So all the bands in Germany at the moment sing in the German language and play typical German music. It’s not very heavy–more like the new wave thing that was happening in England about the late ’70s. Scorpions have been together now for ten years. How has your music changed, if any, over the years? I think the major change happened when we started to make Lovedrive, because before that we had two directions in the band. We had a guitar player who was very Hendrix oriented, and therefore we could never focus on one style. We had two styles. When he left and we did the next album, the band was in one direction. And since then the band has become known worldwide. How does your current lead guitarist, Matthias Jabs, differ from your previous ones, Michael Schenker and Ulrich Roth? Matthias is totally a player for the band. Michael was the same, but with Ulrich it was “Ulrich Roth and the Scorpions” or “the Scorpions and Ulrich Roth”. You need a guitar player who works with the band, in one direction. I think Matthias does that. You can hear it especially on Blackout. Why did Michael Schenker quit Scorpions in the first place? In 1972 or ’73 he had an offer from UFO. 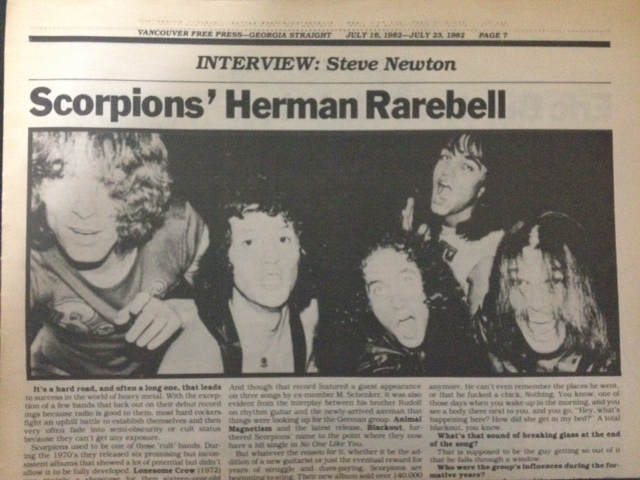 And in those days Scorpions didn’t earn any money and they were in really bad condition. And he took the offer because it was a really good one. And he quit the second time [after appearing on Lovedrive] because he wanted to make his own career with his own band. Do you think he’ll be playing for you again sometime? Maybe as a guest, you know, on an album. But that’s all. I don’t think any of us would consider working with him again because the band is as it is now. We’d like to keep it that way. What’s the title track of your new album about? It’s about a geezer who goes out and gets drunk and gets so out of it that he can’t remember anything anymore. He can’t even remember the places he went, or that he fucked a chick. Nothing. You know, one of those days when you wake up in the morning, and you see a body there next to you, and you go, “Hey, what’s happening here? How did she get in my bed?” A total blackout, you know. What’s that sound of breaking glass at the end of the song? That is supposed to be the guy getting so out of it that he falls through a window. Who were the group’s influences during the formative years? I think out main influence of the past, of the late ’60s and early ’70s, was Led Zeppelin. Before that, for me, it was the Yardbirds, and obviously Jeff Beck. And the Kinks and the Beatles. What do you think of Canada’s heavy metal bands? I think there’s a lot of good heavy acts coming out of there. Triumph, and Rush, and lately Saga is a pretty good band. There’s a lot happening over there, especially with heavy metal.